With an average return on investment (ROI) of 87%, according to Remodeling Magazine’s annual Cost vs. Value Report, decking is a great investment. It not only helps boost home value, but also increases outdoor living space – giving you an area in which to entertain – curb appeal, and so much more. But in order to fully enjoy your new deck, you must also invest in Deck Lighting. Walking around at night can be dangerous if you can’t see where you’re going. It doesn’t take much to trip over a deck board or slip on a toy that your son/daughter left lying around. Deck lighting can help Improve Safety by illuminating your outdoor area. This is especially important around stairs. Burglars love the darkness. Deck lighting helps instantly Improve Security by keeping the entrances to your home well-lit. In 2012 alone Baltimore saw 7,770 burglaries, 17,397 thefts, and 3,605 robberies, according to City-Data.com. How secure is your home? Don’t worry, deck lighting is Durable and built to stand up to everything Maryland weather can throw at it. Finally comes Aesthetics. The proper deck lighting can bring an entire new look to any deck, whether it is made of pressure treated wood, plastic decking, or other material. Freedom Fence and Home has been building decks and adding deck lighting for more than two decades to houses throughout Maryland. All of the members on our crews are trained and experienced to handle your lighting needs. And our installment team can usually complete the job within a day. We offer a variety of fixtures for your deck lighting needs, from the traditional to the modern; our inventory will have something for everyone. 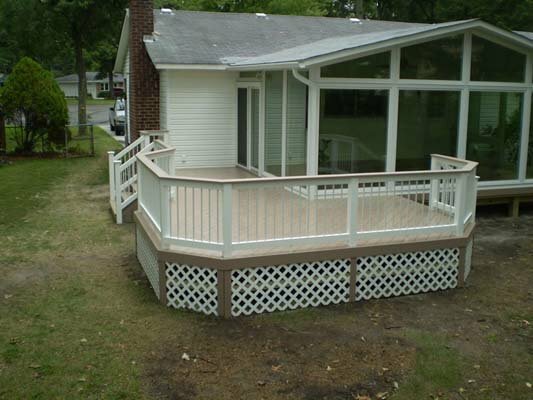 If you have any questions about Deck Lighting Services in Maryland, please contact Freedom Fence and Home by calling 443-271-6841 or visit our website. You can also follow us on Facebook and Twitter! This entry was posted on Wednesday, July 16th, 2014	at 7:55 pm	. Both comments and pings are currently closed.